Posted in: Dromida, Radio Control. Tagged: New Releases, RC, Upgrades. 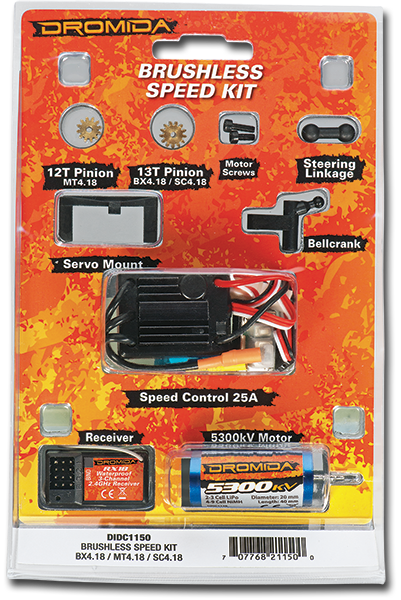 The newly released Dromida line of RC vehicles recently announced a Brushless Speed Kit upgrade. The Kit will fit all 3 Dromida vehicles and should deliver speeds of up 30mph; that is 10 mph more than the stock Brushed Speed Kit. The kit includes a 5300kV Brushless Motor, BE18 25A Brushless ESC, RX18 Receiver and all the necessary hardware and accessories, including 2 different pinion options. The Brushless Speed Kit has a MSRP of $99 and can be found using Part# DIDC1150. It is pretty neat that they have included everything in one package, it will keep things smooth and easy.